Making invoices is great, but what's even better is getting paid. We wanted to make this workflow as effortless as possible: that's why we partnered up with Zoho. Supports both Zoho Invoice and Zoho Books, as well as a multi-organisation setup. Select the Zoho client to which you want to invoice within Temponia, no need to reenter client data. Your invoice will automatically appear in Zoho. Temponia will use the invoice number generated by Zoho. You are able to print the invoice within Temponia, using the layout you have defined in Zoho. You can add or remove items on your invoice in Zoho. When the status of an invoice changes in Zoho, this will be updated in Temponia as well. Zoho is a comprehensive suite of online productivity, collaboration and business applications for businesses of all sizes. Zoho’s productivity and collaboration applications include Email Hosting, Document Management, Office Suite, Project Management and more alongside a host of business applications ranging from CRM and Campaign Management to Customer Support, Accounting and more. Over 13 million users rely on Zoho apps for their business. 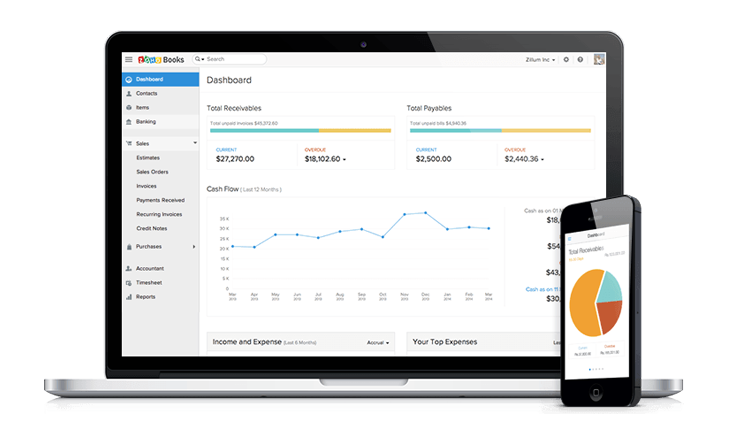 Zoho Books is a simple, easy-to-use accounting software designed for small businesses and freelancers to manage their business finance. Get quick access to critical business information easily with Zoho Books - either on the web or mobile. Eliminate data entry with Bank Feeds. Have all your transactions automatically updated and categorized. Get paid faster with online payments. You can also discuss recent quotes and share invoices with client anytime. Avoid file transfer. Save time by inviting your colleagues and accountant to your books real-time. Do away with crumpled paper receipts in your wallet. Simply snap & upload receipts for claiming deductible expenses during tax-time. Find out more or try Zoho for free.